Why do people have religious ideas? And why thosereligious ideas? 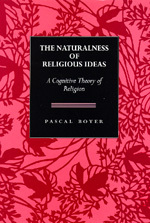 The main theme of Pascal Boyer's work is that important aspects of religious representations are constrained by universal properties of the human mind-brain. Experimental results from developmental psychology, he says, can explain why certain religious representations are more likely to be acquired, stored, and transmitted by human minds. Considering these universal constraints, Boyer proposes an exciting new answer to the question of why similar religious representations are found in so many different cultures. His work will be widely discussed by cultural anthropologists, psychologists, and students of religion, history, and philosophy. Pascal Boyer, Senior Research Fellow in Cultural Anthropology at King's College, University of Cambridge, is the author of Tradition as Truth and Communication (1990).